All-Inclusive: Rate includes breakfast only, but additional Meal Plans available as well as dive packages. Challenge me to beat anyone’s quote! The Fantasy Island Resort offers 109 newly renovated guestrooms decorated in colorful Caribbean pastels, and all facing the beach. 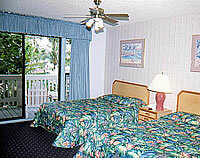 Each guestroom features a tile entrance and wood floors, and is equipped with air-conditioning, a ceiling fan, color television, telephone, refrigerator, a sitting area, a balcony with ocean view, and an in-room safe. All bathrooms feature both a tub and a shower. The Fantasy Island Beach Resort Dive & Marina was built to accommodate the needs of traveling divers. The convenient dive center features a fleet of four custom 42 foot dive boats directly adjacent to the spacious guest gear storage area, underwater photography center, compressors and equipment rental facility, where all needed gear can be rented for those who prefer to travel light. At the Fantasy Island Beach Resort Dive & Marina you can also get your SSI or PADI certification, and Nitrox is available for those certified in Nitrox Diving. In the event of emergencies there is also a hyperbaric chamber on site. In the beautiful blue waters of Roatan you can expect water temperatures in the low 80F in summer and high 70F in winter. Although visibility can peak at 100 feet or more, expect an average of 80 feet, unless when storms or plankton cloud the water. 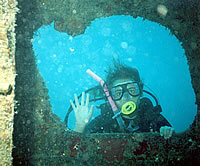 Over 50 spectacular dive sites, including the famed south shore dive sites, are but minutes away. Fantasy Island Dive & Marina operates four custom dive boats. 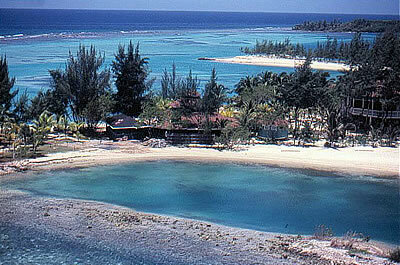 All dive trips depart from the resort dock, with three boat dives daily (9am, 11am, and 230pm). Night dives are available weather permitting and depart at 6pm. For those who prefer to dive from shore at their own place, day or night, a unique dive Gazebo places a mysterious shipwreck, a sunken airplane a beautifull shallow reef and dramatic wall diving just a giant stride away. Fantasy Island is a complete Water Sport Center and Marina. Powerboats, sailboards and ocean kayaks, along with other activities, are available to guests. The Fantasy Island Resort serves breakfast, lunch, and dinner daily in the casual, yet elegant on-site restaurant, where you can dine indoors our outdoors as you please. 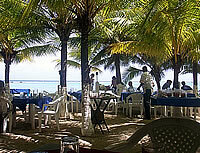 The restaurant features expertly prepared selections of the finest continental and island cuisines. The resort also features two lively bars that offer live entertainment for your enjoyment on a frequent basis. So, what do you have to lose?